Global AI in agriculture market expected to reach approximately USD 2,075 million by 2024, at a CAGR of slightly above 21% between 2018 and 2024. Availability of numerous equipment and modern day technologies such as intelligent monitoring system, drones, and robots has made agriculture industry a cusp of technological revolution. The report covers forecast and analysis for the AI in agriculture market on a global and regional level. The study provides historic data for 2015, 2016, and 2017 along with a forecast from 2018 to 2024 based on revenue (USD Million). The study includes drivers and restraints for the AI in the agriculture market along with the impact they have on the demand over the forecast period. Additionally, the report includes the study of opportunities available in the AI in the agriculture market on a global level. This report offers comprehensive coverage on global AI in the agriculture market along with market trends, drivers, and restraints of the AI in the agriculture market. This report includes a detailed competitive scenario and product portfolio of key vendors. To understand the competitive landscape in the market, an analysis of Porter’s Five Forces model for the AI in the agriculture market has also been included. The study encompasses a market attractiveness analysis, wherein all segments are benchmarked based on their market size, growth rate, and general attractiveness. This report is prepared using data sourced from in-house databases, secondary, and a primary research team of industry experts. 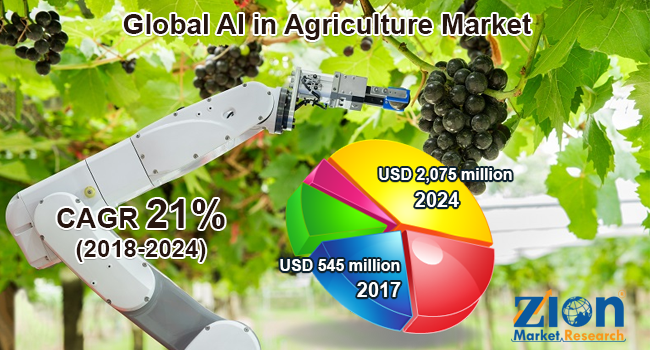 The study provides a decisive view on the AI in the agriculture market by segmenting the market based on technology, component, application, and region. The technology segment is divided into machine learning and computer vision. The component segment is further divided into hardware, software, and services. The application segment is segmented into agriculture robots, agricultural drones, driverless tractors, facial recognition, crop health monitoring, and automated irrigation systems. All the segments have been analyzed based on present and future trends and the market is estimated from 2018 to 2024. The regional segmentation includes the current and forecast demand for North America, Europe, Asia Pacific, Latin America, and the Middle East and Africa with further country wise division include the U.S., Canada, Mexico, the UK, France, Germany, Italy, China, Japan, India, Australia, South Korea, Brazil, Argentina, Saudi Arabia, the UAE, South Africa, and Israel. The report covers detailed competitive outlook including the market share and company profiles of the key participants operating in the global AI in agriculture market are Microsoft Corporation, aWhere, Granular, Agribotix LLC, IBM, Mavrx Inc., Prospera Technologies, Resson, Spensa Technologies Inc., The Climate Corporation, and Precision Hawk.